Civil engineer and ironmaster Henry Habberley Price worked widely in Britain, including in South Wales, and for a short time assisted Thomas Telford (1757-1834). A partner in Neath Abbey Ironworks, Glamorgan, his lively career encompassed projects and ideas for river navigations, harbours and railways — although he was active at the height of the 1830s boom when many rail schemes were developed but not realised. He was born into a network of Quaker industrialists. His father Peter Price (1739-1821) was employed at ironworks in Britain and North America before establishing Perran Foundry in Cornwall in 1791 with Samuel Tregelles (1766-1831) and Robert Were Fox (1754-1818), among others. 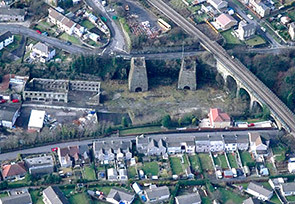 In 1792, they leased Neath Abbey Ironworks and gained a reputation for the high quality of its products. Price's engineering apprenticeship began in 1808, and he subsequently worked on navigation improvements to the rivers Suir and Lee at Cork in southern Ireland. It’s thought he worked for Scottish engineer Alexander Nimmo (1783-1832), who had collaborated with Telford on surveys in the highlands. In 1818, Price became a partner at Neath Abbey, with his elder brother Joseph Tregelles Price (1784-1854) as managing director. From 1820, they built beam engines and steam engines for the Cornish mines, later making railway locomotives but avoiding armaments, in line with their pacifist beliefs. They also constructed gasworks throughout South Wales and had interests in colleries and other works. Price's civil engineering practice took him to many other parts of the country. In 1824, he began work for the Tees Navigation Company, recommending the construction of Portrack Cut in the River Tees west of Middlesborough, improving navigable access to Stockton-on-Tees. The cut opened in 1831, though associated groynes designed to increase downstream velocity led to silting of the coal staithes at Middlesbrough used by the Stockton & Darlington Railway. The ensuing dispute would last five years. He worked under Telford in 1825-27 as engineer for the new Old Ferry Passage Piers in the Severn estuary. It's possible that they worked together earlier as Price met Telford in 1823, when improvements to the South Wales mail road were under consideration. Among the reports made by Price are ones on Swansea Harbour (1831) and Falmouth Harbour (1835). He also worked on the proposed Sidmouth Harbour in Devon, transporting stone for the breakwaters along a new railway line. However, the project wasn't completed. Various railway schemes came and went, including a line between London and South Wales, and another between Gloucester and Hereford. Price was a corresponding member of the Institution of Civil Engineers, a Fellow of the Geological Society and a Member of the Royal Irish Academy. He lived at 4 Parliament Street in London's Westminster, and at Brynglas in Neath, Glamorgan. He married in 1824 and his three sons (and at least one grandson) all went on to become engineers. However, his two daughters were lost at sea in 1854 when their ship bound for Philadelphia went down with all hands. 1823 Granted a patent (18th March) "for an apparatus for giving increased effect to paddles used in steam vessels, applicable to rotary movements, by which they are generally worked"
1839 Dies (8th March) at Brynglas, Neath, aged 44 — buried in the grounds of the town's Quaker Meeting House (built 1799), probate proved 30th March 1839 ... In January 1840, the ICE "lament" his death and record that "Mr. H.H. Price was, when in town, a constant attendant at the Meetings, and took a lively interest in the proceedings and success of the Institution"
In 1824, Price begins work for the Tees Navigation Company, and makes two reports. 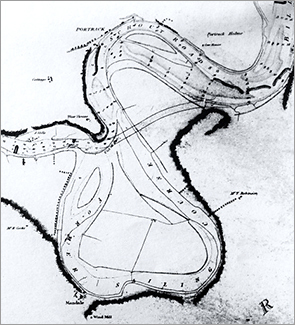 He recommends the construction of the Portrack Cut (completed 1831), downstream of the earlier Mandale Cut (1810, William Chapman) on the River Tees, west of Middlesborough in the UK. 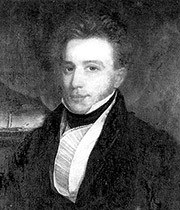 Under Price's direction, William Edgeworth (c.1794-1829) made two surveys of possible routes. A detail of one of those is shown here. 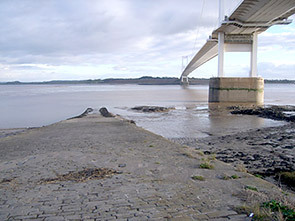 The Beachley slipway on the Severn Estuary, with the Severn Road Bridge soaring overhead. In 1827, Price became engineer for the Old Passage Ferry Piers, one at Aust on the English side of the estuary and one at Beachley. They served a new steamboat commissioned by the Old Passage Ferry Association, reviving the ferry service to Wales. 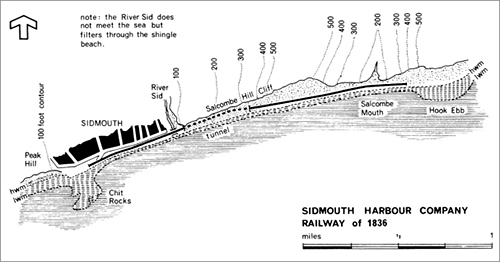 Plan of the route of Sidmouth Harbour Company Railway (1836), at Sidmouth, Devon. Price undertook the engineering for a proposed harbour at Sidmouth, constructing a 3ft6in gauge railway to move stone from Hook Ebb (at right) to the designated site at Chit Rocks (at left), where two L-shaped piers were planned. Note the tunnel section in the centre. Although the railway was almost completed, the project funding failed. Remains of a length of Sidmouth Harbour Company Railway (1836) protected from removal by an early cliff fall and more-recently revealed by storms. The track ran on iron-tipped piles (some of which can be seen on the beach), or rock footings. 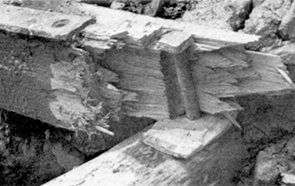 A 10mm thick wrought iron running strap was laid on the timber rails (visible at left). The sleepers were at 910mm centres. The remains of Neath Abbey Ironworks (Riverside Works, 1792), Neath Abbey, Glamorgan. Price's father, Peter Price (1739-1821), became resident manager of the works in 1801. Price and his brother Joseph Tregelles Price (1784-1854) took over as partners in the company in 1818. 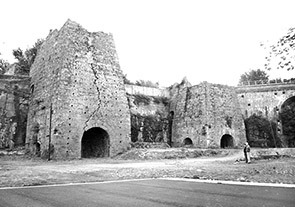 Neath Abbey Ironworks's blast furnaces were set up in 1793. Under Price's father, the works gained a good reputation and was an important manufacturer of Cornish engines. By the time Price snr died, in 1821, Price family interests dominated the running of the company, and Price's brother was running associated collieries.